This is the tenth post in a series examining the Vue.js source code line-by-line. In the last post, we examined the camelize function in order to better understand what is happening in the normalizeProps function. 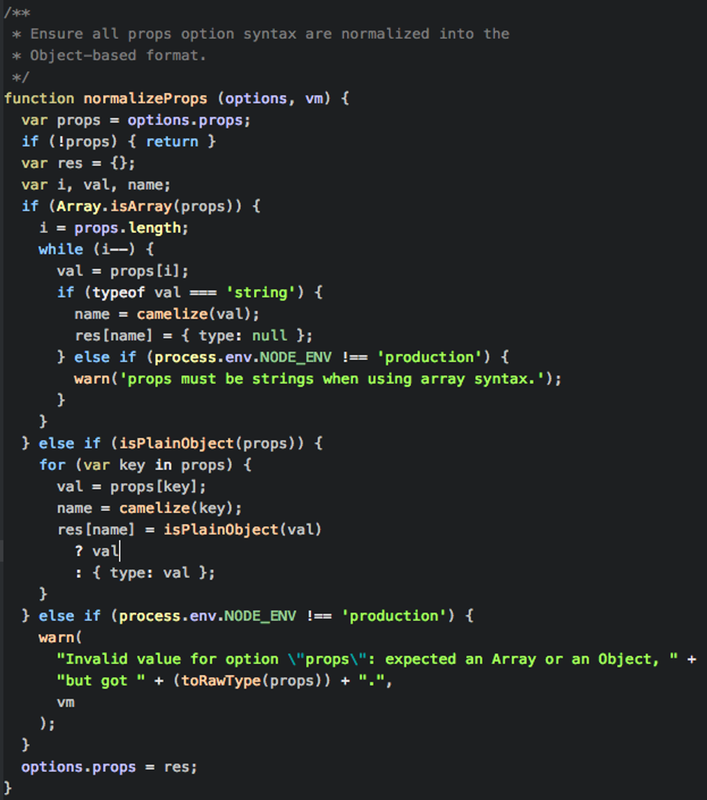 In this post, we turn back to the code of the normalizeProps function. Now that we have reviewed the camelize function, we understand thatcamelize first checks the cache object (wrapped in a closure) to determine whether the passed value (here, val) matches a property/key on the cache object. If val has already been cached, the camelize function returns the previously cached result. If val has not been cached, the camelize function calls the String replace() method to replace the hyphen and the first letter after the hyphen in a word. camelize replaces hyphen delimited words by removing the hyphen and uppercasing the first letter after the hyphen. Next, the normalizeProps function: (1) sets a property on the res object with the newly camelized value (i.e., name) as the property name, (2) initializes it as an object, and (3) sets a property on the object named type to null. As promised in a previous post, we will take a look at the warn function in the next post.